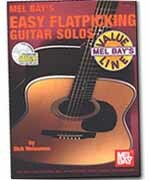 This book is designed to help the beginning to intermediate flatpicking guitarist in developing control of the pick. The author introduces a number of traditional and ethnic styles and discusses various flatpicking techniques including up and down picking, crosspicking, and playing with a combination of pick and fingers. The approximately 30 progressively arranged pieces in the book are useful in learning to read both standard notation and tablature. Where practical, suggested chords are offered for a second guitarist. A companion CD is included - all at a great price!